Marcella Pixley’s seventh-grade English teacher, the published poet Doug Worth, gave her plenty of good advice about writing back when she was his student at Brown Junior High School in Newton in the early 1980s. But perhaps the best direction the Westford resident took from him came just four years ago, when Worth attended a reading that followed the publication of Pixley’s first young-adult novel, “Freak,’’ a semiautobiographical story about a female adolescent’s struggle with school bullies. “You used to always write about magic,’’ Pixley recalls Worth saying. “I thought your first published book would be fantasy. Why did you become a writer of realistic fiction?’’ It was a good question, Pixley realized - and questions are where the author’s best ideas come from. She thought for a little while about what her former teacher had said. And then she started writing again. The result of that soul-searching exercise would eventually become her second young-adult novel, “Without Tess,’’ published this month by Margaret Ferguson Books. The book’s official launch is tomorrow at 4 p.m. at the Concord Bookshop, 65 Main St.
“Both ‘Freak’ and ‘Without Tess’ began with questions I had for myself about unresolved issues, things that are really hard for me to talk about or think about,’’ said Pixley, who is not only an author; she is also the mother of two young boys and a full-time teacher at the Carlisle Public School. More specifically, the inspiration for the second book came from a tragic event in Pixley’s past. An adored cousin, a year older, and with whom she played imaginary games as a child, died of cancer at the age of 16. But it wasn’t until she started writing this book that she acknowledged the emotional unrest at the core of the project. “I had never properly grieved for my cousin. I was unable to talk about her with anyone, as if keeping my memories hidden would somehow keep her tucked away inside me. Pixley teaches four sections of eighth grade in Carlisle, and leads two writing groups, one for middle-schoolers and one for her colleagues. She is also frequently tapped for other kinds of professional guidance, such as when she helped lead an antibullying workshop for faculty and staff before the school year began. “My interest in the topic of bullying comes from my own experience having been bullied, which is also why I wrote ‘Freak.’ And then because of that book, I’ve been talking about the issue in schools all around New England,’’ Pixley said. “The workshop combined what I’ve learned from talking about ‘Freak’ ’’ with her collaborator’s experience leading the school’s antibullying club, she said. Pixley hears about the experiences of her own students in Carlisle as well. Finding time to write while holding down a teaching position and raising two sons, ages 4 and 8, is a continuing challenge, Pixley said. 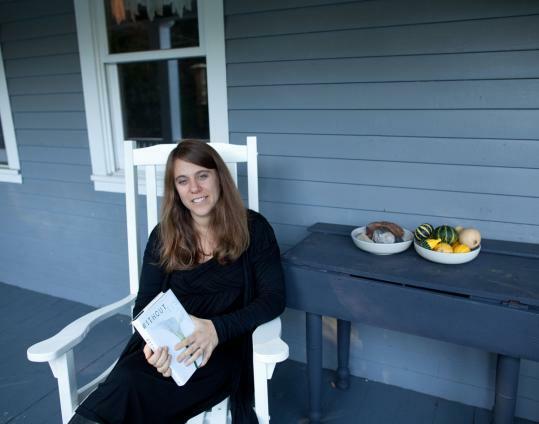 Summer vacations help in terms of giving her more time to write, as does the fact that her husband is also a teacher - at Oak Meadow Montessori School in Littleton - and has a schedule similar to hers. Having two published novels under her belt is a good feeling, Pixley said, but she’s not even thinking about leaving her day job. To the contrary: She has come to believe that teaching eighth-graders and writing fiction for an audience that same age creates an ideal symbiosis. During classroom writing sessions, Pixley frequently explains a concept and then has the students try it out themselves - while she does the same. Students and teacher alike then critique each other’s work. “I don’t think I could ask for a better place to be or a better situation to be in as a working person,’’ she said. “My students give me a tremendous amount of energy and they’re my audience. Following the official launch of “Without Tess’’ tomorrow, Pixley has readings coming up at Newtonville Books on Oct. 23, the J.V. Fletcher Library in Westford on Oct. 27, and the Gleason Public Library in Carlisle on Nov. 3.